I’ll make it easy for you: buy this book. Creating Cities is an engaging, well-written overview of the Renew Newcastle effort in Australia that helped turn the moribund downtown of a fading steel city into one of Lonely Planet’s top ten global travel destinations in 2011. But not only a breezy read and a feel good case study, this book is also a celebration of bottom-up urbanism, and citizens taking the revitalization of their city into their own hands. In contrast to the typical top down planning, or consensus-driven civic initiative, this is about taking a small scale, organic, DIY approach to urban life. And about how the legal, regulatory, and business practices environment of a city can be hacked to make that possible. For decades, Newcastle was the BHP Steelworks. We grew up in its shadow. The night sky was lit by the flames of blast furnaces, and the city set its rhythms to its changes of shifts. In nearby suburbs, mothers and grandmothers played washing-line roulette around its belching smoke and changes of wind direction. It was a city of a few hundred thousand people, and at its peak, a tenth or more of the Novocastrian workforce was employed in the steelworks. The whole city was directly and indirectly dependent on it. Westbury was a young festival organizer who grew up in Newscastle. After getting a start there, he moved on to success in Sydney and Melbourne. He was originally attracted back to his home town by the prospect of starting a small pub. Central Newcastle was full of boarded up buildings, so he was sure that he’d be able to find a place with dirt cheap rents to open his dream bar. As it turned out, he couldn’t have been more wrong. He had great trouble finding anyone who would even show him a property, much less offer him rental terms. Something more substantial was wrong here. I lost sight of my original purpose – starting that bar is still on the long list of unrealised dreams – and became more and more intrigued as to why the market and the owners weren’t behaving the way Economics 101 told me they should. An oversupply of properties should have led to a drop in the market price. So many sellers and so few buyers in the market should have meant that agents and owners were falling over themselves for my business. But the response to my approaches was indifference and lack of interest. It was a diagnosis out of kilter with the debate that the city was having at the time. The debates in local papers or in political circles had always begun from the premise that the reason the city was failing was due to a lack of interest and investment. No one wanted to do anything there. But as I had directly experienced, this wasn’t always true. What if the problem was more complex? What if the problem was not that no one wanted to do anything but that those who wanted to, for whatever reasons, couldn’t? The bigger picture in all this was bizarre. A city full of people desiring to do things, staring at a seeming surplus of space in which to do it. Dozens of property owners unintentionally driving down the value of their properties. Bankers concerned so much with the paper value of assets that they were running down the actual value. Perfectly legal and simple things that no one could confirm the legality and simplicity of. Governments at all levels were obsessing over how they might revitalise the city while unintentionally and inadvertently making the problems worse by confused processes, deferred decisions, and making promises they could not keep. Everyone was acting in their own interest while the city as a whole was literally falling apart. Renew aimed to invert processes. It aimed to make what once had been hard easy, and what would once have been risky much less so. To take as much of what might once have been near impossible in the city and make it comparatively simple. The purpose was always to plant many seeds and see what grew. For that to work, the seeds couldn’t all be the same. To nurture an ecology, you can’t begin by planting a monoculture. In the first six years of its existence, Renew Newcastle launched 170 different endeavors. Some of them turned into actual businesses that ultimately signed real leases. It created a media sensation around the world, attracted academic investigators, and even led to Newcastle making Lonely Planet’s top ten global destination list in 2011. 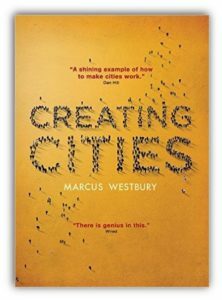 Beyond just an interesting case study, Creating Cities outlines Westbury’s philosophy of citizens taking responsibility for their own cities and neighborhoods. The book opens with a vignette about his grandfather creating a handmade sign for a hard to find local landmark. He laments that as our society matured and bureaucratized, we lost something of this spirit of citizen initiative without noticing it amongst the gains we were making. I’m not sure he’d see the lineage between the sign he raised on that hill those many decades ago and the ideas outlined in this book. But that sign has always animated me. It has given me a sense of place, of continuity and connection. It has given me something else: an idea planted in the concrete up there. The idea that you could do that. That a community is built up by the thousands of actions from hundreds of individuals and their collaborations, and not down from the whims of the few. A recurring reminder that a community is something you make and remake through your actions….I’m not sure exactly when it happened, but somewhere along the line between my parents’ generation and my own, we forgot that it could work like it did in Bert’s time. Public space became more regulated, and the once-simple intersection between individual and community action, civic improvement and control became more and more complex. Cities became expensive, privatised, professionalised and bureaucratised. Infrastructure became the job of master planners and middle managers. Societies became more individualistic, more competitive, and more unequal. People got busy. They ran out of time for such things. By the time I came of age, the idea that an individual could build something in their shed and place it permanently on public lands was almost unthinkable. Westbury is also acutely aware of the way that his professional mindset affects his approach to city problems. I, for example, come from a management consulting background. That shapes the way I think about cities, and one reason people find my take on cities refreshingly novel is that I’m one of the few people using that lens to look at cities. Westbury is open about the way that being a festival organizer led him to think about the possibilities of utilizing urban space in ways that planners, politicians, and architects couldn’t. He fails to mention one aspect of the festival organizer’s DNA, however: promotion skills. Undoubtedly Renew Newcastle became so widely known in part because of Westbury’s savvy marketing skills. In fact, I suspect that back home he’s got quite a collection of haters going, who think that he’s used it as a massive self-promotion platform. I say more power to him. While not the purpose of the book, Creating Cities also implicitly throws a bit of cold water on some conventional wisdom explanations of central city decline. For example, some Americans blame racism for white flight that decimated cities. No doubt that played some role, but Newcastle had virtually no minorities, yet its downtown collapsed anyway. It’s similar for explanations predicated on freeways. I haven’t investigated in full detail, but Google maps does not appear to show inner city freeways of the type that carved up so many US cities in Newcastle. Yet its urban core faded anyway. It would appear that something in the very nature of industrialization and deindustrialization produces these types of declines. Other factors are merely enhancers at most. The ubiquity of post-industrial struggles in cities all over the globe undercuts many country-specific explanations. The book also shows that what appears simple and straightforward in economic theory is often much more complex in practice. If this is true at the micro level, then how much more so at the macro. Can the ideas being Renew Newcastle work elsewhere? I don’t see why not. In fact, I even know one organization in Indianapolis that did something similar, albeit not as an institutionalized approach. Big Car Gallery did a deal with the landlord to take over an abandoned service station near Lafayette Square in Indianapolis, on the proviso that they vacate if an actual tenant was found. Eventually one was found and Big Car relocated. Big Car executive director Jim Walker was very clear to stress that this had always been the plan, and I didn’t see any negative media suggesting that Big Car had been “kicked out.” This is critical as Westbury notes. Landlords have to be confident that if they allow temporary uses like this, they can actually get their building back when they want it without looking like the bad guy. Renew Newcastle is a powerful story that I hope to one day be able to check out in person. In fact, I previously ran a guest post about it by Westbury. I’m glad to see he turned this into a book, and Creating Cities is one that belongs in every urbanist’s Kindle. Newcastle is a great little town and well worth a visit. It might be a lot sleepier than you expect, but the city is right on an fabulous surf beach with beautiful Art Deco pavilions and ocean baths. It’s surprisingly attractive and urban at its center. The temperature never gets below 50 degrees and rarely goes above 110. Definitely a ‘shoes optional’ kind of place.